Blogger Opp: Free Sign-ups for What A Woman Wants Event! Read on to sign up! This is a free blogger event and accepting signups now. PLEASE SAY Christine at Why We Love Green referred you! Thanks!! 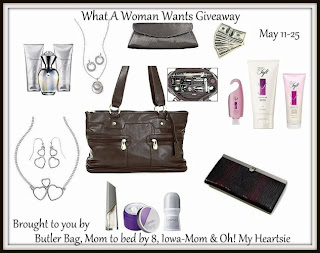 Join the What A Woman Wants Giveaway event today, grow your readership and offer one amazing prize package including a Butler Bag (RV$215), $50 Cash, Jewelry, Skincare, Bath products and more!